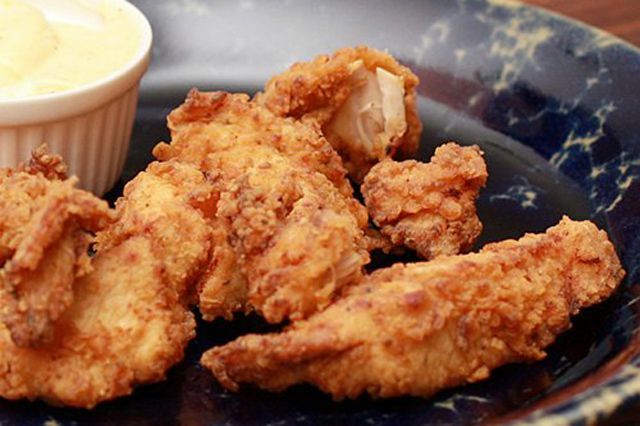 Turkey tenderloin pieces are marinated in a simple mixture of milk and spicy seasonings, then they're battered and deep-fried to perfection. Feel free to use turkey cutlet pieces or chunks of turkey breast in this recipe, or use chicken breasts or chicken tenders. Cut the turkey tenderloins into 1- to 1 1/2-inch pieces. In a large food storage bag, combine the turkey tenderloins, half-and-half, garlic, and Creole or Cajun seasoning. Let the tenderloins marinate in the refrigerator for about 2 hours. Heat oil in deep fryer to about 360 F.
Dredge the turkey pieces in the flour, coating well. Shake off excess flour. Deep fry the turkey nuggets until golden brown, about 4 or 5 minutes.